In terms of the overall design principle, the Reeven Kiran is a good example of being low key and stealthy. It is designed to not show off the fan itself, but to emphasize the RGB effects of the fan. Therefore, you can see the base frame of the fan is made out of black plastic, while the impellers look like frosted plastic with a glossy coating. 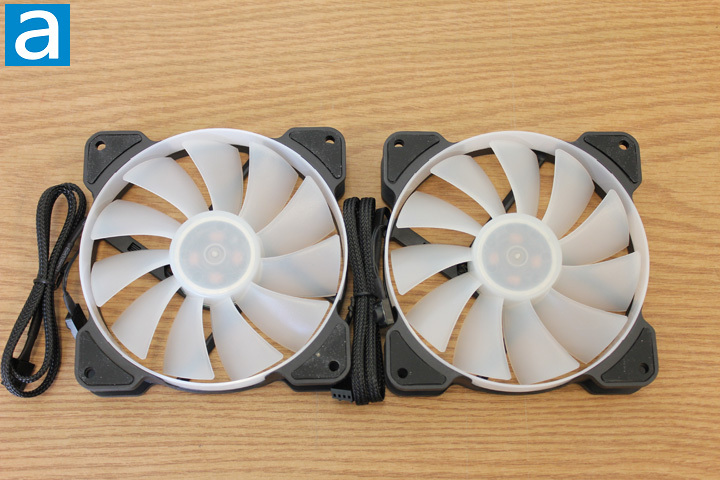 Around the impellers, there is a ring also made out of frosted plastic to enhance the RGB effects of the fan. The company’s logo and the product’s name is located on the motor housing back cover. Since there is no protection on the air intake side of the fan, be very careful of your fingers if you want to do any modifications to your computer while it is on. One feature I like from the Reeven Kiran fan is the rubber pads around the screw holes. All four of the mounts have the rubber pads to minimize noise and vibration. I will talk about this later when we discuss the noise level. According to Reeven’s product description, a fluid dynamic bearing is used for the Kiran to achieve a long lifetime and silent operation. Fluid dynamic bearing allows the load to be supported by a thin layer of rapidly moving pressurized liquid or gas between the bearing surfaces. Because there is no physical contact between the moving parts, the sliding friction is minimized, and consequently the wear and vibration are also reduced. In this case, the Kiran has 120,000 hours of life expectancy. Personally, I believe the fan will just run silently for a long time if you do not intentionally break it. Flipping over the fans, you can get a closer look at the impeller design. According to Reeven's official website, the design of its impeller is to produce high airflow with their rectangular shape. From the specifications, we can see the maximum CFM or cubic feet per minute, a commonly used unit to measure airflowm of the Kiran is rated at 64.8 CFM. The Kiran has pretty good airflow performance for a 120 mm fan, therefore it can be used on the front or top panel of the computer case to allow more air to get into the computer case. Air pressure is another important metric to evaluate the performance of a fan. On a typical computer case, there could be mesh that causes some obstruction to airflow, which requires the fan to have the strength to pump the air through. A way to measure this strength is the mmH2O. The Kiran features 2.95 mmH2O maximum. In my opinion, Kiran strikes a good balance between the airflow and air pressure. Note, that the maximum airflow and air pressure is measured at the highest RPM. In other words, it requires the fan to work at 1500 RPM to achieve these values. 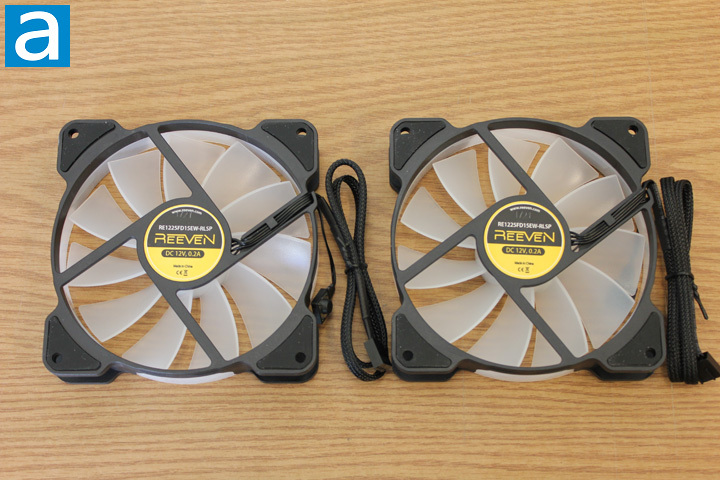 Noise is another factor that people may be concerned about when choosing computer case fans. One way to theoretically evaluate the noise level is by using dB, decibels. dB is a logarithmic unit to measure how loud the sound is. For the Reeven Kiran, the minimum noise level is 6 dB, while the maximum noise level is 33.6 dB. Overall speaking, it can be considered as pretty quiet for normal use. As a RGB fan, Kiran has six RGB LEDs soldered on the PCB behind the motor housing. The light can be diffused to the whole area of the impellers thanks to the frosted plastic. Personally, I like this kind of design a lot. Compared with other designs that have LEDs installed at the fan's corners, which creates extra wires that are exposed, the Kiran does not have any extra wires for the LEDs. Because all the LEDs on the Kiran are well hidden under the motor housing, there is no way to accidentally break the LEDs or the wires. In fact, if you go to the review of the BitFenix Spectre Pro LED, you can see that on top of the Spectre Pro LED Blue, the connection for one of the LED wires was loose and had to be resoldered. In this case, the Kiran features a much better design in terms of protecting the LEDs and the wiring. On the other hand, the RGB lighting modes and colors of Kiran can be easily changed by a push button near the power cable. Using that button, the user can switch through all seven solid RGB colors and three lighting modes. It is a very straightforward design, as no software is needed to control the RGB, neither do you need to spend extra money on any control box. This simplicity does come at the expense of convenience and flexibility compared to software control though.